You may not get tropical climates and palm trees in these countries but you get culture, you get medieval architecture and an amalgamation of cuisines shaped by migrants from all over Europe who have taken their national dishes and fused them with their host countries. Belgium is different to a lot of European states, both to the west and east of it. Its capital Brussels is within a thousand kilometres of most of Europe’s major capitals and is considered by many an understated “capital of Europe” because that’s where the European Parliament is based. Weather-wise Belgium has mild winters and cool summers and is accessible all year round, a plus point for tourists. Belgium boasts a rich heritage where past meets present. This is characterised no better than by the capital Brussels, which houses an impressive European Quarter with historical monuments that include World Heritage Sites like the Grand Place. There’s the Gothic town hall and St Michaels Cathedral for those who want to experience some religious nostalgia. The more hip part of Belgium is definitely Antwerp. Perhaps men wanting to buy an engagement ring for potential wives will be lured in to the city to purchase diamonds. Or maybe for those too shrewd to be tied down to the old ball and chain, students may fancy heading off into the city centre of Antwerp home to vibrant clubs and bars that will keep you entertained. 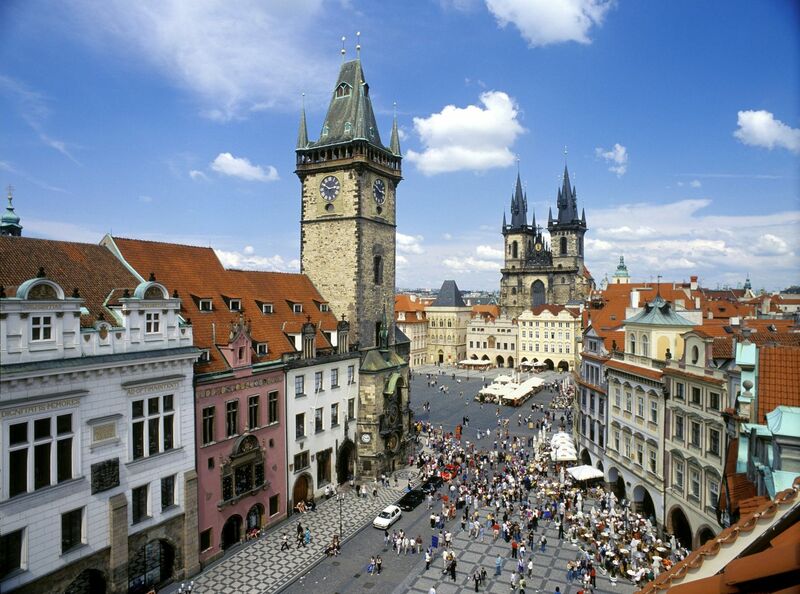 The Czech Republic has really come to the fore in recent decades and its tourism industry is booming. Its capital Prague has become synonymous with men looking to go for a weekend and experience the bars and strip clubs. Referred to as the “Amsterdam of the East,” young men and students looking to enjoy stag parties will not be disappointed; just don’t forget to ask your girlfriends for permission! Of course there is so much more to the Czech Republic then clubs and bars. In the north-east region of Prague lays the Bohemian Paradise. Here tourists will find some of nature’s finest rock formations and isolated castles. Finer architecture can be visited near Znojmo when you pass by Baroque Castle and St. Margret’s Cathedral. Lovers of ski sports will find solace in the Nove Mesto na Morave ski resort, which is more than a simple slope. It’s a large area dedicated to cross country skiing, so adrenaline junkies looking to take on the mountains within this remote region will have an absolute ball. Unlike a lot of ski resorts in Europe where space is limited, tourists will have more than just a few slabs of snow to improve their ski skills on. If you want to avoid all that and let your hair down, take a short trip to Mutenice Wine Region and pour yourself a glass of the local tipple. Just don’t drink too much and wind up with your face flat on the local streets wondering where you are the following day! The Netherlands is one the most popular tourists attractions in Europe. The weather like much of the states located in Central Europe enjoys fair winters and tolerable summers. Its capital Amsterdam has gained notoriety among much of the world’s youngsters because of its tolerance of marijuana and lax drug laws. Amsterdam boasts great culture thanks to many migrants who have settled here and assimilated from countries that were formerly apart of the Dutch Empire. The canals that run through the city are serene and its museums showcasing artefacts collected from the Dutch Colonial period impressive. Football fans may want to visit the Amsterdam arena, home to the Ajax football team. Famed for their infamous trophy collection during the summer tours can be arranged to learn about their football history and style that has had a profound affect on much of Europe. The accommodating and liberal attitudes leave a good impression on tourists who tend to come back. For those tourists who want to shun the jam-packed city of Amsterdam one can pack their bags for Maastricht. Maastricht is medieval to the core and tourists will love the culture and atmosphere as the south is a lot more relaxing and family orientated compared to the rest of the Netherlands. For the complete student adventure where you will be raving from late at night until the morning sunrise, look no further then Groningen. The entire city is dedicated to pure fun, and of course studying during the day. So don’t party too hard. Situated in the south of Europe, it shares Spain as a neighbour through the Iberian Peninsula. The climate is generally warm all year round with the temperature rarely dropping below fifteen degrees throughout the country on average, maybe to five degrees during the winter. Northern Portugal, home to its second city Porto, is littered with historical significance. It carries great weight because it is where Portugal was born as a state nine hundred years ago. Known as the “Invincible City” Porto is located near river Douro and Atlantic Ocean and draws in tourists in droves because of its museums. Aveiro and Braga give Portugal its European attachment. Aveiro is referred to as the “Venice” of Portugal because the city stands afoot of canals. Continuing with the Italian theme, Braga is the “city of Archbishops” and is a draw to tourists looking to learn or discover religious enlightenment in the city. The capital Lisbon is home to shopping malls and modernity, clearly a draw to women who love Gucci shoes and Prada handbags. But for those bachelor and bachelorettes looking to paint the town red, enjoy a booze fest and create embarrassing memories head to Algarve. Constant sunshine and lovely blue sea is perhaps what you need after a hard years worth of working or studying. The Algarve will rival any Spanish island in terms of party atmosphere and marvellous beaches. Sweden is in northern Europe bordering both Finland and Norway though is physically connected to Denmark through the bridge of Oresund. The Baltic Sea lies to the east of Sweden and conditions are usually very cold in the country, reaching just below mild temperatures in the summer. Norrland is home to nine provinces of Sweden and the most beautiful parts of the country. The largest cities in the region like Gavte, Umea and Lluea are surrounded by lots of wilderness, forests, rivers, lakes, marshes and mountains. The vastness of it takes up half the country alone. The region is great for you tourists looking to go hiking or have some fun on the ski slopes. The central part of the country is home to its capital Stockholm and the more industrialised parts. Tourists along with the natives are granted the ancient “right to roam.” This simply means people can go anywhere they like, even on private property so long as they respect the privacy of people. Due to Stockholm being made up of islands, you can hire out canoes and go fishing or sailing throughout the archipelago. Watching the sun rise in the background on a chilli morning whilst you hook back your fishing rod will appeal to older folks, so don’t forget to tell Granddad and Grandmother to pack their suitcases for this holiday. Sweden is perhaps suited to tourists that take families along with them looking for a more peaceful holiday abroad.